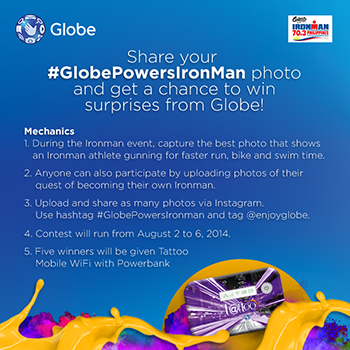 Share your #GlobePowersIronman photo and get a chance to w in Globe Mobile Wifi with Powerbank. Contest runs until August 2 to 6, 2014. During the Ironman event, capture the best photo that shows an Ironman athlete gunning for faster run, bike and swim time. Upload and share as many photos via instagram. Use hashtag #GlobePowersIronman and tag @enjoyglobe. Visit Globe Telecom Facebook page for more details and latest updates.